The Hidden Mountain: Music & Sound Design Studio in Milan. SoundCloud — used to stream audio; collects usage data. Vimeo — used to stream video; makes use of browser cookies and usage data. Dropbox — used to stream video; collects usage data. No data is stored directly by us or on our servers. To remove undesired cookies, please use your browser's settings or All About Cookies. Feel free to contact info@hidden-mountain.com for any additional information. The Hidden Mountain is an artist-run studio specialised in sound design, audio engineering and music production. Active since 2014, we’ve had the pleasure to work with Alberta Ferretti, BMW, Chanel, Giorgio Armani, Gucci, Nike, Intimissimi and artists like Ludovico Einaudi, Vaal, Alex Menzies, DJ Tennis and Casino Royale. Somewhat established musicians in our own right, we release on Universal, R&S, Decca, Deutsche Grammophon, Pinkman, Nonplus, Kompakt, Life and Death, Bedouin, Vakant, Veyl and many others. Vice, Dazed, FACT, NPR, i-d, Resident Advisor, Vogue, Clash, Mixmag and Rolling Stone have all featured our work. Watch our sound design reel above, stream hours of our productions or get in touch — we're always open to new collaborations. Sound design for Intimissimi x Chiara Ferragni digital campaign. Sound design for Hunting World's 2019 Collection digital campaign. Mixing & engineering for Risveglio di Una Città by Somne. Released on Aura Dinamica. A&R for Previously Undisclosed Rituals II, a various artists compilation featuring December, TV.OUT, Vaal, Operant, Ayarcana, Lost Highway and DJ Loser. Released on Veyl. Mixing & additional production for Nosferatu LP by Vaal. Released on Pale Blue Dot. Album of the Month on Mixmag, January 2019. A&R for B.R.U. by Empire State. Released on Veyl. Sound design for Alberta Ferretti Limited SS19 digital campaign by Alberta Ferretti. Mixing & additional production for Blue Eyes by Vaal, the second single from Nosferatu. Released on Pale Blue Dot. Premiered on Clash Magazine. Sound design for the Nike x Holy campaign by Nike. A collaboration with Holy Drink. Sound design for Bea Bongiasca 2019 digital campaign. Production, engineering and mastering of Through All Windows I See Only Infinity by The Sarcasm Ensemble. Released on Veyl. Sound design for No Ka Oi SS19 digital campaign. Mixing & additional production for Nosferatu by Vaal, the first single from her debut album by the same name. Released on Pale Blue Dot. Featured on Billboard. Sound design for Sergio Rossi’s FW19 digital campaign. Production & mixdown of Subtle Violence by Maenad Veyl featured on Previously Undisclosed Rituals Vol. 1, a various artists compilation on Veyl. A&R for Previously Undisclosed Rituals Vol. 1, a various artists compilation featuring Years of Denial, Autumns, RNXRX, Maenad Veyl, Rhyw from Cassegrain as Poison Green and Exhausted Modern. Released on Veyl. Sound design for Bea Bongiasca 2018 digital campaign. Music licensing for Stella McCartney Eyewear 2018 digital campaign. Sound design for Chiara Ferragni Collection FW18 campaign by Chiara Ferragni. Sound design for No Ka Oi SS18 digital campaign. Sound design for Acquazzurra SS18 campaign. Sound design for Sergio Rossi FW19 campaign. Sound design for Sergio Rossi SS18 campaign. Sound design for CR Fashion Book MFWSS19 editorial by Carine Roitfield. Production, mixdown & mastering for Not What You See, Not What You Feel by Maenad Veyl. Released on Veyl. Featured on Resident Advisor. Production & mixdown for Ate-Up by Avatism. Mastered by Andreas Kauffelt. Released on Vakant. Art direction, music production, mixdown & mastering for Liberation video single by Maenad Veyl. Directed by Tomaso Lisca. Premiered by NPR. Production, mixdown & mastering for The Acceptance ov Not Knowing by Maenad Veyl. Released on Veyl. 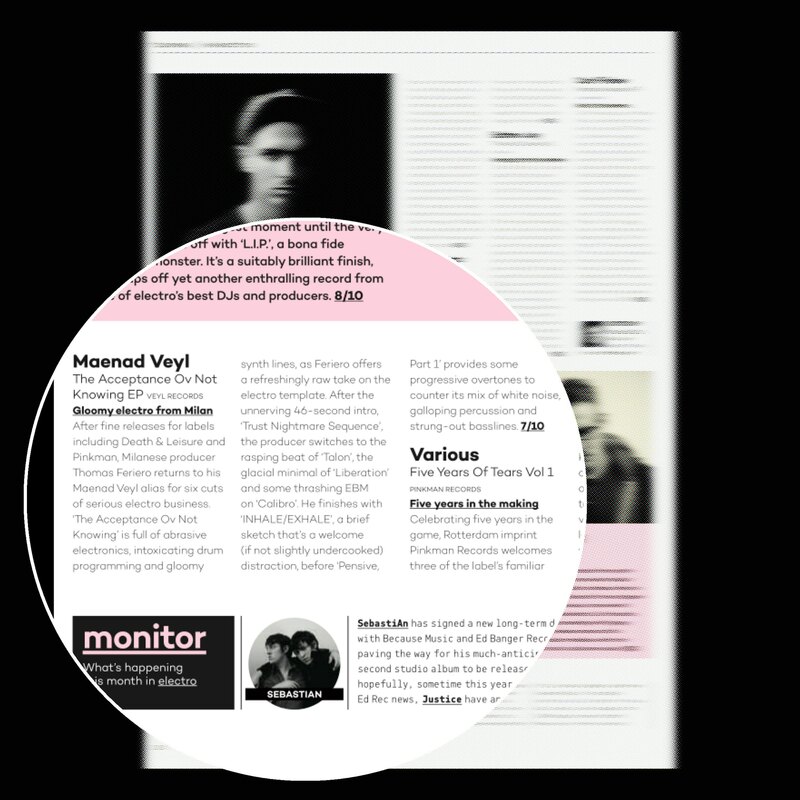 Featured on Mixmag. Production & mixdown for Somehow, Somewhere They Had Heard This Before by Maenad Veyl. Mastered by Rude66. Released on Pinkman Broken Dreams. Featured on TRAX Magazine. Best Music of 2018 by NPR. Production, mixdown & mastering of three tracks on untitled Maenad Veyl/Years of Denial split 12" EP. Released on Oliver Ho's Death & Leisure. Mixdown & engineering for Endless Remixes by Tale of Us. Released on Deutsche Grammophon. Sound design for Alexachung AW17 campaign. Production & mixdown on Mare Remixed by Christian Löffler. Released on Young Alaska. Mixdown & engineering for Speed, Noise, Machinery & the City by Somne and Portrait. Released on Aura Dinamica. Production & mixdown of Killing the Hour by Avatism. Mastered by Beau Thomas. Released on Nonplus. Production & mixdown of Bad Summer by Avatism. Mastered by Andreas Kauffelt. Released on Parachute. Mixing & engineering for Parallel Window by South London Ordnance. Released on Parachute. Production & mixdown of I Was Warned About People Like Us by Avatism. Mastered by Andreas Kauffelt. Released on Vakant. Best New Music on Vice. Mixdown, engineering & mastering of Benevolence by Opus 3000. Debut album classical/electronics hybrid from Francesco Leali, Alessandro Branca and Gloria Campaner. Released on INRI Classic. Mixdown, engineering & mastering of Benevolence, first single from the debut Opus 3000 album. Released on INRI Classic. Premiered by self-titled. Mixdown & engineering of Dead Soul by Hunter/Game. Released on Just This. Mixdown & engineering of Metropolis by Somne. Released on Just This. Editing for Le Palais Idéal editorial by DRY Magazine. Production, mixdown & engineering on Lover Over Will Remixes by Alex Smoke. Released on R&S Records. Production, mixdown & engineering on Ringleader by CW/A. Released by Parachute. Mixdown & additional production on Divions/Chirality by DJ Tennis. Released by Life and Death. Sound design for Ajmone Sartorial Leather's launch campaign. A&R for Pitiparti by POORGRRRL. Released by Parachute. Mixdown & engineering for Adaptation by Hunter/Game. Released on Kompakt. A&R and additional production for Words Unspoken, Acts Undone Remixes by CW/A featuring Metrist and Simbiosi. Released on Parachute. Mixdown, engineering and co-production for Before We Sleep album by Camara. Released on Parachute. Mixdown, engineering and co-production for Just Waking Up by Camara, the first single from Before We Sleep. Released on Parachute. Premiered by FACT. A&R for the bluezz...rn by POORGRRRL. Released by Parachute. Premiered on Wonderland. A&R for self-titled debut of Neunau, a found-sound art project by Sergio Maggioni. Released on Parachute. Premiered by Vice. Interactive sound design for Acqua di Giò iOS app by Giorgio Armani. Developed with FELD and Armando Testa. Recording of Upfront 038 for Boiler Room. Sound design for Acqua di Giò campaign by Giorgio Armani. Sound design for Giorgio Armani Christmas Gift campaign by Giorgio Armani. Sound design for Flying Mini, a short promotional movie by BMW, John Cooper Works and M&C Saatchi. Production, mixdown & engineering for Elements Remixed by Ludovico Einaudi. Released by Decca. Mixdown & engineering for Speicher 87 by Kompakt. Production, mixdown & engineering for Words Unspoken, Acts Undone by CW/A. Released by Parachute. TRAX Magazine Top 15 Albums of 2015. Production, mixdown & engineering for Bury the Hatchet video single by CW/A. Released by Parachute. Directed by Giorgio Gremigni. A&R, mixdown & engineering for Music for Chairs by Bop. Released by Parachute. A&R for Fabric Safety Apparatus various artist compilation featuring Ayarcana, Avatism, Clockwork, Metrist and others. Released by Parachute. Mixdown & engineering for three tracks on Fabric Safety Apparatus various artist compilation. Released by Parachute. A&R and production for Void Transcripts various artist soundscape compilation. Released by Parachute. Premiered by Resident Advisor. Production & engineering for Endings by CW/A. Released by M_REC LTD.
A&R, production & engineering for Day of Riddance by CW/A. Released by Parachute. Sound design for Oysho AW15 campaign. Sound design for N++ by Metanet Software. Available on Windows, Sony Playstation 4 & Microsoft Xbox One. Sound design for In Her Early Light short movie by Riccardo Meroni for Antonioli. Sound design for In His Early Light short movie by Riccardo Meroni for Antonioli. Production for Monsters Remixed by Abby. Released by Universal Music. Engineering & additional production for Local by DJ Tennis. Released by Life and Death. Mixdown & engineering for Clockwork remix on Meditations in an Emergency by Locked Groove. Released by Permanent Vacation. Additional production & engineering for Millenium by Somne. Mixed by Tobias. Mastered by Beau Thomas. Released by Nonplus. Sound design for GREY x GUCCI short movie by GREY Magazine. Sound design for Air Force 1 campaign by Nike and Riccardo Tisci. A&R and production for Adamant Remixes 2 on Vakant. A&R and production for Adamant Remixes 1 on Vakant. Production for Adamant by Avatism. Mixed by Hannes Bieger. Mastered by Andreas Kauffelt. Released by Vakant. Additional production & engineering for B.O.A.T.S. by Clockwork. Mixed by Francis Harris. Mastered at Calyx. Released by Life and Death. Production & engineering for Clunker Remixed by Spitzer. Released by Infinè. Production & engineering for Constants by Avatism. Released by Vakant. Production & engineering on One Trick Pony featured on Fabric 65 by Matthias Tanzmann. Released by fabric.